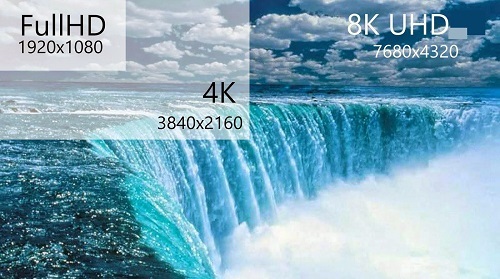 Much before the 8K display computer enter the market, Microsoft released its OS level support for 8K video resolution. But which is the best 8K video player for Windows 10? There there, the first 8K 4320p video player for Windows 10 - 5KPlayer is recommended, which not only goes smoothly with the new Windows 10 OS to play 8K movies, but also handles 4K 5K 4320p UHD videos with skill. Free Download 8K Video Player for Windows 10: Superb 8K! The free 8K video player for Windows 10 is the NO.1 mature response to 4K 5K 8K Quad UHD video playback on Windows 10 platform. All the way 5KPlayer has been dedicated to video pixel and resolution, thus taking the lead in fast upgrade to play 4K 5K 8K 16K UHD videos on Windows 10/8/7 PC and tablets. Since the free upgrade to Windows 10, the return of Start Menu grasped all eyes while, the abandon of Windows Media Center aroused discomfort. Can't find the best free 8K video player on Windows 10? Here you are in the right place.
" Why is it The Best Ever Freeware for 4K 5K 8K Quad UHD Videos?" Functions stand for themselves. Quite a number of 8K media players have run into a dilemma on Windows 10: For one thing, they only have obsolete Codec to handle 4K 5K 8K videos, which is the exact reason why so many people are not able to play the YouTube 8K videos on PC; In addition, most are not like 5KPlayer for Windows 10, aka they haven't yet smartened into the new Windows 10 platform, for example, the VLC having problem with Windows 10. So how does 5KPlayer managed to play 8K videos withou choke? Well, unlike most media players that execute abiding disk space of the computer for video playback, 5KPlayer for Windows 10 configured to support H.265 streaming, which is an codec applied to Windows 10 to substitute H.264. So every time when you play an 8K video with this 8K video player for Windows 10, it gathers every spare memory of the computer, performing Quad UHD 4320p 1080p videos to the fullest under limited space and device conditions. The 8K resolution support of Windows 10 was announced on WHEC April, 2015, while certainly 8K video is not for every PC: the 8K support for Windows 10 will be for displays larger than 27 inches, as well as a Microsoft Dirext X9 display card with WDDM. To make it clear, a mere upgrade to Windows 10 without a professional third-party 8K player won't play 8K videos AVCHD, MKV for you. But let's look at this free 8K video player - 5KPlayer for Windows 10 recommended here: Ever since the debut of 720p, 1080p and 4K videos started to wow the fashion shows, 5KPlayer has been striving to be the top-notch HD player for Win Vista/7/8/10. Furthermore, given the fact that most users are still moving from conventional HD to the new 4K standard, and it could be many years until 8K display become the majority. This 8K video player for Windows 10 is based on sounder footing to aim for the future of 8K display, that it does an awesome job with 1080p 4K/5K HD videos on Win 10 already. Hence even if you have an aged machine at hand, 5KPlayer empowers you to watch the best HD videos your display can handle. Now let this all-in-one 8K video player for Windows 10 impress you with its 360° support for 8K videos movies playback. Sure enough 5KPlayer for Windows 10 first considers the 8K video resources, that it can download endless 8K videos movies from YouTube. More videos are available from 300+ video sites. And as long as any new video streaming services announce support for 8K playing on PC powered with Win 10/8/7, we'll keep you posted. Despite the lack of 8K video content, it's predicted that Apple's iMac 8K is under experimentation, and such is the case for Samsung and LG 8K TV. So from now on until their release date, this 8K player for Windows 10 will watch closely on any updates and trends to make quick response for iMac 8K video playback. Get WinX DVD Video Software Pack for Windows 10 with 80% off discount to enjoy the most economical way to rip, backup DVDs， download, edit, merge, and AirPlay your Christmas videos on Windows 10 PC. Try 8K Video Player for Windows 10: The Best Ever Media Center! Download 5KPlayer setup for Windows 10 on your PC, sure enough it works perfectly with Win Vista/7/8 to play 4K videos, 5K UHD movies in MP4, MKV, AVCHD, MOV and all popular HD video formats. Step 1: Install and launch this best free 8K video player for Windows 10 on your PC. Note: You may choose to set 5Kplayer for Windows 10 as the default 8K 4320p video player as you please. Windows 10 removed Windows Media Center alongside the DVD support. 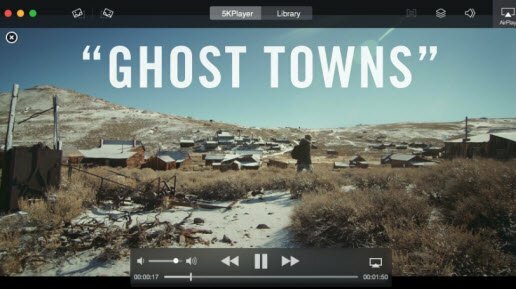 However, this 8K video player can do that job, read this guide on how to play DVD with this very 8K media player for Windows/Mac. Step 3: Download a 8K video clip before you play it via 8K player for Windows 10 PC. Note : 4K 8K UHD videos downloaded online will be saved in the YouTube list. Step 4: Choose the 8K videos in your media library and double click it to play. Note : For computers powered with Win 10 but whose hardware doesn't suffice, you may consider download 4K videos in MP4 MKV or other format to play. Detailed in this article are only a part of the funtions embedded in this one-stop 8K player for Window 10. Just as mentioned above, all those were only sound base of this software for instant and practical use. In order to get more 4K 8K content to watch, you can take a look at this top 10 websites to watch movies online for free. While with this free player for 8K UHD videos has been eyeing for the long run in regard of AirPlay to 8K TV, supplying the future Quad UHD TV screen with splashing 8K 1080p video movies content. Take a look at the best 5 media player for Windows 10 of 2019 to manage your video clips and music playlist back on track. 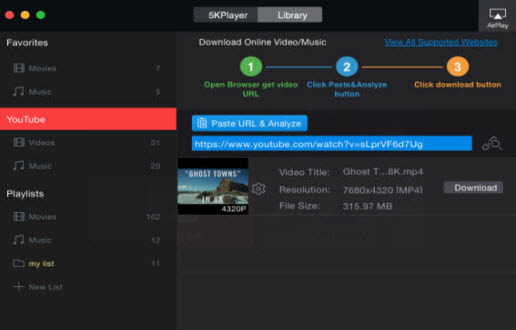 Download this fast video player, able to play videos effortlessly and download videos from YouTube, Vevo, Vimeo on Windows 10.